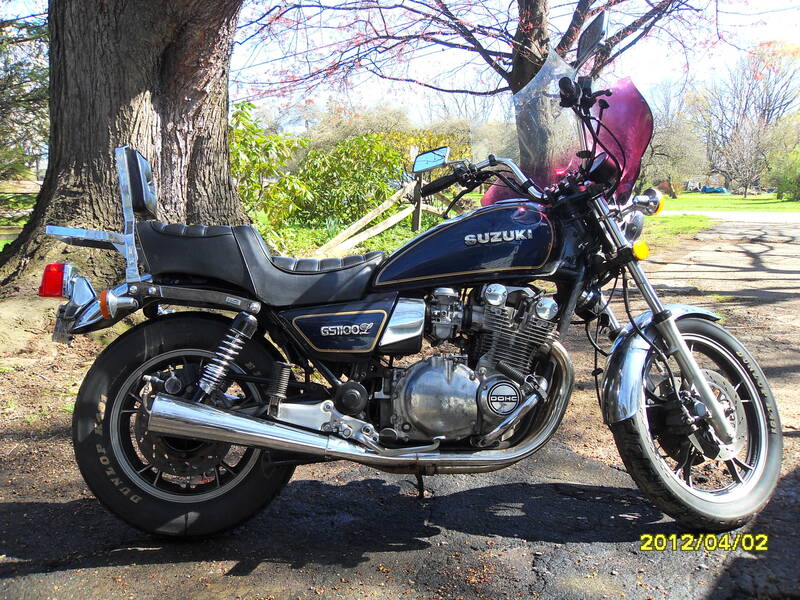 So my Suzuki GS1100L and I have seen a lot of adventures together. I purchased a Rifle Fairing for it, had it installed, and had the bike and fairing painted to match. It was beautiful! Until one spring, maybe ten years ago or so. 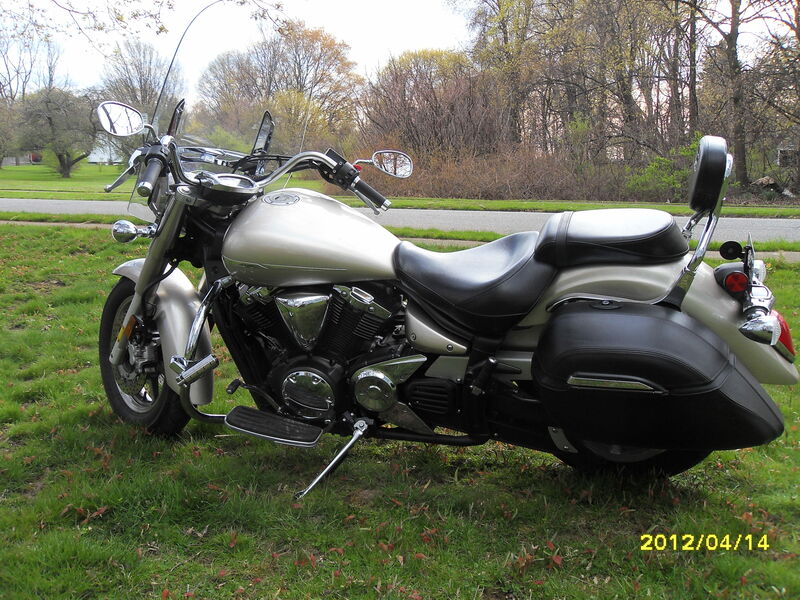 I have an old High School buddy that works on motorcycles in Cochranton, PA (Professional Cycle, http://www.procycle1.com/Procycle1/Home.html. Ask for Dell). For quite a while I took my bikes to him to service, inspect, fix, whatever. So on this particular day, I had gotten up early and rode down to get the 1100 inspected. We live outside of Erie, PA, so it was always kind of a commitment to get there. After he was done I got going, and entered Interstate 79 at Meadville to get home. Beth and I had friends that were getting married that day, so I really cranked the throttle. The 1100 has always had a surplus of power, and within about a nanosecond I was travelling at 90 mph (yeah, I know. First, stupid. Second, way above the speed limit. Third, I’m a cop and know better. Response? One, I think I’m smarter now than then. Two, I don’t drive like that now. Three, blah, blah, blah. Fourth, the statute of limitations is way past, so nyah! And fifth, do not try this yourselves, it’s dumb beyond belief!). About a mile or so north of Meadville on I-79 is a curve to the right, with a “mound” separating the northbound and southbound lanes. Just north of that is an overhead bridge. It was just before that spot that I decided that my left mirror really needed adjusted. As I adjusted the mirror, I drifted left to the edge of the road. I looked up, and I was in the loose part, just entering the curve (at 90 mph).I wasn’t experienced at that point to get myself out of it, and went off the road into the median, which at that location was kind of a grass ditch between the big mound and the northbound lane. I did a fair job of holding on, and started slowing down. Needless to say, the word “calm” was not part of my vocabulary at this point. Panic, terror (literal terror), oh, yeah. But not calm. The rear tire kicked out on me, and I did a low side spill. Motorcycle on its side, and I on my back did a 90 mph slide down the median. I remember my head hitting a rock and I flipped over, hitting my face shield on the motorcycle and bouncing over again onto my back until we both stopped. I got up and looked back, only to see pieces of fairing and motorcycle as far as I could see. Not my happiest moment. I called Dell to come and pick up my bike, and called Beth to come and get me. Needless to say, we didn’t get to the wedding that day (sorry, Steve and Karey). Dell fixed the bike, and I got it home. However, it was a couple of years before I got the guts to get back on it, and then only after taking the PA motorcycle safety course (http://www.pamsp.com/). This is actually a great course, and I would recommend it to every rider, no matter how experienced. This year, I was just “window shopping” online, and looking at bikes. Not seriously shopping, just looking. 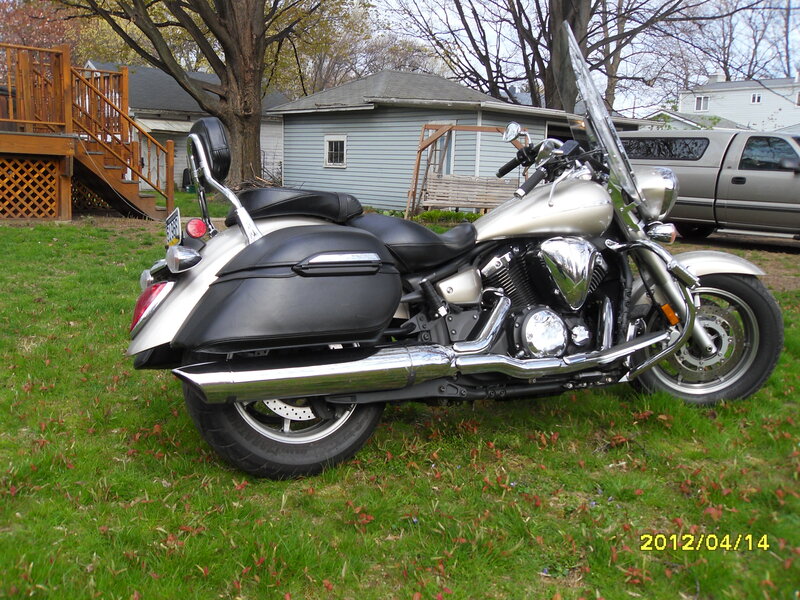 I got to the point that I figured that if I ever got another two-wheeler, it would likely be a Yamaha V-Star. Understand, I have always hated Harleys mostly on principle. So for a long time, V-stars were kind of out, as they had (I thought) a Harley look to them. But this year I changed my mind. I think that instead of a “Harley look-alike” they’re more of a “retro” look, back to the motorcycles of the ’30’s and ’40’s, and I kind of got to like the look. But like I said, I was just window shopping. Until Beth told me that she thought I should get a new bike. What? “Look, Beth, I appreciate that, but really, I don’t think we can afford it.” “No, I’ve looked at the numbers, and I think we can.” Wow! Well so much for “just window shopping!” At that point it became a serious hunt. I narrowed it down to two. Both were V-Stars, both 1300 cc’s, both local, both 2008 models. One was privately owned and kind of stripped down with very low mileage and a bit cheaper. The other was a bit pricier with slightly higher mileage, around 12,000 miles, but dressed out. 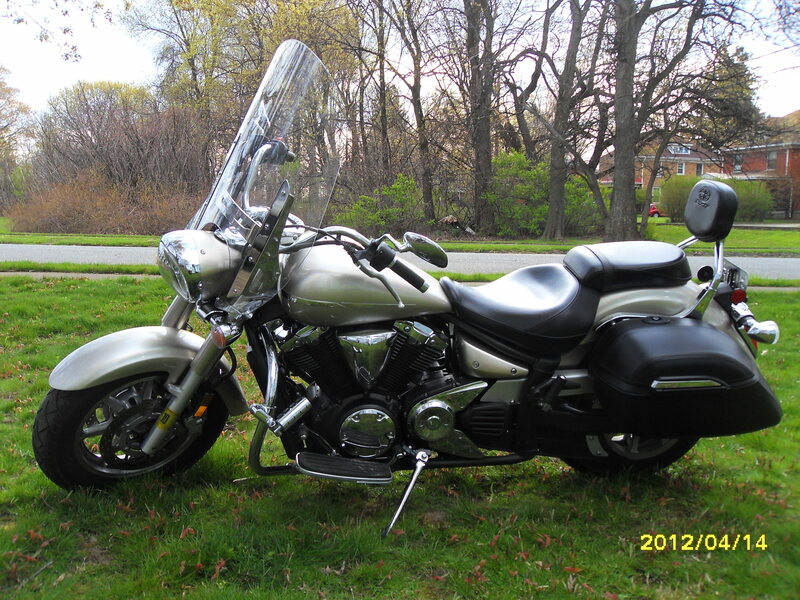 The second one was being sold by Precision Bike Works in Erie (http://www.precisionbike.com/), and was the Tourer model, dressed out with windshield, engine guard, and backrest. I took a couple of hours on a Friday afternoon and looked at both of them. Beth, to my surprise, also took time off work, and went with me. We stopped at Precision Bike Works first and talked to Rich. The Tourer was beautiful and dressed up just as I would like. I couldn’t ride it as it was buried in the back by several other bikes, but she was a beaut! The privately owned ‘Star was just as beautiful, and I got to take her out for a short spin. BOY was that a sweet ride! A bit less expensive, only around 1,400 miles, it was pristine! Since it was close to dinnertime, Beth and I went to the Tap House in Erie (http://www.upick6.com/). We sat down, got an appetizer and I got a beer. We talked over the two bikes, compared them, pluses and minuses. 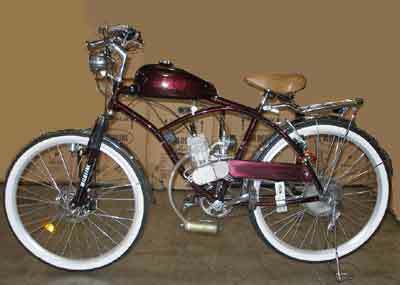 I described the less expensive one, and how it had low miles, and I could build it up over time with a windshield, backrest, and so on. Beth said, “You’re not getting that one. You’re getting the Tourer.” Now, I don’t normally take orders well, but when she said that, I immediately (after picking my jaw off the floor) called Precision Bike works and told Rich I was buying it, while simultaneously calling for the check and paying the bill. I didn’t even finish my beer! We paid up and were on the way back to put money down on the bike in record time. Nah, just kidding, here’s the real deal!